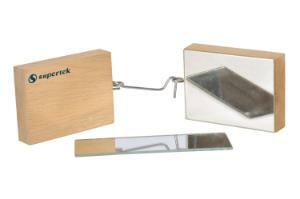 The Friction Block Set is ideal for simple friction experiments. This set consists of a glass mirror with sandpaper affixed to one side and two wooden blocks: one with a hook and the other with an eye. The latter block also has a mirror cemented to one face.